Can song lyrics ever be poetry? 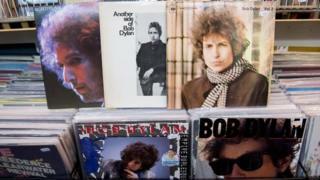 Bob Dylan's Nobel Prize has reignited the debate about whether song lyrics can ever be considered literature. Is it time to finally tear down these cultural barriers? Every now and then an esteemed literary figure will see fit to pass judgement on the works of a pop star. It's been going on since the early 1960s, when songwriters first began to aspire to something more than rhyming "moon" with "June". The literary establishment, both horrified and fascinated by the attention being lavished on these long-haired upstarts, felt it was incumbent upon them, as cultural gatekeepers, to say something. In recent years, it is rap stars that have found themselves in high culture's cross hairs. In 2003, no less a figure than Nobel laureate Seamus Heaney hailed "this guy Eminem", who he said had "created a sense of what is possible" and "sent a voltage around his generation". John Sutherland, professor Emeritus of Modern English Literature at University College London, has compared the late Tupac Shakur's Hit Em Up - a blistering, foul-mouthed assault on his perceived rap rivals - to the vers libre of 19th Century American poet Walt Whitman. Rap is a "very word-centred" form, argues Sutherland, and its essence is in rhyming and unfettered self-expression. Image caption Eminem: The heir to Bob Dylan? But Eminem and Tupac were never going to be the first songwriters to win the Nobel Prize for Literature. That honour was probably always going to belong to Bob Dylan. Dylan is one of the very few musical artists to have spawned their own cottage industry in academia, with Oxford poetry professor Christopher Ricks getting the ball rolling in the early 1970s, by comparing the folk-rock troubadour to Keats. Dylan's lyrics - ambiguous, playful and allusive - lend themselves to furrowed-brow study in a way that the vast majority of song words do not. Many music fans will be eternally by grateful for that. Lyrics are not meant to be "poetry" and vice versa, they would argue. "Songwriters are not poets," wrote Simon Armitage, one of the UK's most popular poets, in 2008 in The Guardian. "Or songs are not poems, I should say. In fact, songs are often bad poems. Take the music away and what you're left with is often an awkward piece of creative writing full of lumpy syllables, cheesy rhymes, exhausted cliches and mixed metaphors." Any songwriters feeling slighted by Armitage's assessment of their craft can always seek out his own song lyrics, written for his hobby band, which he admitted in a 2013 interview, were "on the whole, too wordy". The poet is an admirer of Alex Turner, chief songwriter of The Arctic Monkeys, whose witty, punning lyrics about everyday life on the band's early albums were seen as being firmly in the English social realist tradition of Jarvis Cocker or Ray Davies of The Kinks. These writers clearly have a gift for putting words to music. Does it matter whether the results are considered literature or not? Professor Howard Rambsy, who teaches a course on rap lyrics at Southern Illinois University, firmly believes that it does. He is "excited" by Bob Dylan's Nobel Prize - and he says he has no time for those on social media who say it should have gone to a "more deserving" novelist or poet. It helps settle the "big debate" about whether lyrics are worthy of serious literary consideration. "At least for the Nobel Laureate committee, the answer is yes," he says. Prof Rambsy finds discussing the lyrics of rapper Jay-Z a good way to engage young literature students and get them thinking about concepts like allusion and alliteration. "There are always good lines in rap, clever wordplay that brings various ideas together in a way that is both eloquent and relevant. But the ones that stand out are those who can weave the ideas into a story," he says. Rap has some literary roots - such as Sixties radicals The Last Poets and Gil Scott Heron, writer of The Revolution Will Not Be Televised, who began his career as a novelist - but rap artists tend not to wear their literary ambitions on their sleeves in the way that Bob Dylan's generation of coffee house wordsmiths did. There was two-way traffic between the literary and musical worlds, which began with the Beat Poets in the previous decade. Leonard Cohen, a published poet, slid effortlessly into the role of folk balladeer. John Lennon published a volume of nonsense verse In His Own Write. Song words began to be printed on gatefold album sleeves, allowing the audience - educated young people desperate for the music they loved to have some depth and meaning - the opportunity to pore over them as if they were great works of literature. Big-selling artists such as the Beatles and The Rolling Stones, taking their cue from Dylan, began to expand their lyrical palette and tackle more serious subject matter. "The difference is that Dylan was always effortlessly serious, he wasn't trying," writes Dylan biographer Howard Sounes. "He was serious just because he had a great mind." "Regardless of whether it's right to call them poetry, his songs are highly poetic and highly literary - intricate and subtle and clever and funny and profound and sad: everything you can want writing to be. There's no one who deserves the Nobel Prize more." Dylan himself has rarely expressed any great literary pretensions, despite taking his stage name from revered Welsh poet Dylan Thomas (he was born Robert Zimmerman). Although the 1965 Dylan quote that has often been held up as an example of his brilliant insouciance, when he described Smokey Robinson as "America's greatest living poet" was recently revealed to have been invented by a Motown records press officer. "Why bother even telling Bob?," Al Abrams the press officer in question recalls saying, in a 2011 book on the Motown publicity machine. "That sounds just like something he'd say anyway."